If the overwhelming whiteness and maleness of his appointees to date are any indication, it’s unlikely that President-elect Donald Trump will extend the current administration’s work in support of women and girls of color. But at a White House gathering Friday, a group of government officials—all women of color themselves—reflected on their efforts to address challenges facing this demographic and encouraged a room full of advocates, academics, and funders to keep pushing for change at the federal level. Several years ago, the Obama administration was criticized for ignoring the needs of girls and women from marginalized communities even after it launched an initiative on behalf of boys and men of color. 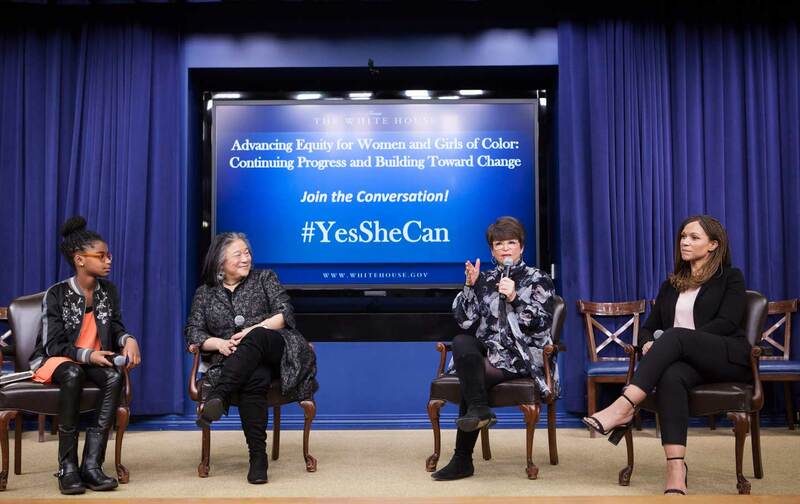 But the White House Council of Women and Girls responded to pressure in recent years, inviting sustained collaboration with community-based organizations and individuals whose work addresses race- and gender-based disparities in health, education, employment, and criminal justice. On Friday, participants celebrated that collaboration and acknowledged their fears and uncertainty around what comes next. After all, many of the appointees Trump has tapped for high-level positions so far are likely to be more comfortable ignoring or vilifying racial- and gender-justice organizers than partnering with them. But all is not lost, Karol Mason told the room Friday. Mason is assistant attorney general in the Office of Justice Programs at the US Department of Justice. “We only lose that progress if you just sit back and let it happen,” she said. Progress in recent years has included federal agencies’ efforts to collect new data and make it public, acknowledge disparities, and measure whether policy changes are closing the gaps. Access to more information has validated communities’ concerns and given them new tools to advocate for change. For example, the Education Department’s Office of Civil Rights began to collect and release more specific data on school discipline disaggregated by race, gender, and disability and easily searchable by school or district. The USDOE saw a 20 percent reduction in incidents of school discipline over two years, Catherine Lhamon, assistant secretary of the its Office for Civil Rights, said Friday. “What I’d really like to see is the Trump administration also commit to the same level of accessibility and transparency with the data,” Fatima Goss Graves, a senior vice president at the National Women’s Law Center, told me. Graves’s organization has been in conversation with the White House in recent years about the need for such accountability measures. “Having that information has been an extraordinarily powerful tool for communities, for families, for parents and for advocates,” she said. Graves listed some ways that those who care about progress for women and girls from marginalized communities can stay vigilant in the opening weeks and months of the Trump administration. This will mean making sure that Betsy DeVos, the nominee for education secretary, and other officials who are slated to play a key role in civil-rights enforcement, are asked tough and relevant questions during confirmation hearings. It means tracking the policies and guidance documents created during the Obama years to see how and whether they’re used in the next administration. Graves is confident that groups nationwide are ready to meet this challenge. “There’s a serious movement that is outside of any government, that is clear in its mandate to do better by women and girls of color, and that is powerful,” she said. Friday’s event was an opportunity for the Obama administration to highlight its own work in these final weeks before Trump’s inauguration. It was also a chance for two related groups that launched last year at the White House—one a collection of women’s foundations in 23 states and Washington, DC, the other a nationwide collaborative of research institutions—to report on what they’ve accomplished in 2016. The Collaborative to Advance Equity Through Research (of which The Nation is a member) has grown from 24 members and a commitment of $18 million over five years to 55 members committing more than $75 million toward research and data collection on the lives of women and girls of color. Prosperity Together’s 29 members have pledged a collective $100 million investment in the economic security of low-income women. In 2016, the foundations put $29 million toward the initiative, directly supporting nearly 1,000 nonprofit organizations and more than 4 million women and girls, according to a report obtained from the Ms. Foundation for Women, an original partner in the funding initiative.